If you have to say you are the GOAT... you're not the GOAT. For those of you not familiar with the acronym, the "GOAT" is "greatest of all time". Don't worry, the goat isn't hurt... he just flopped. Perhaps I am falling right into LeBron James' trap by writing about another crazy thing he said on his television show... but what can I say bait works. The only explanation of his disrespecting people who have suffered and are suffering through real slavery and claiming he is the greatest of all time is that he is trolling us. He is saying something ludicrous in order to get us to reference his show. Don't worry, I am not even going to attempt to address his offensive comparison of slaves to millionaires. I just want to address his statement concerning his win over the Warriors in 2016. According to LeBron, "That one right there made you [himself] the greatest player of all time." Before I begin, let me give a little perspective. First, I am 47 and think LeBron James is the most athletically gifted athlete I have ever seen. It is as if a mad scientist merged Karl Malone and Michael Jordan to form the fastest, most powerful athletic freak in existence. Second, I love LeBron's deeds off the court. He may be the GOAT of charity work. Third, although I am from Chicago and loved the 1990s Bulls, I am not a huge Jordan fan. Oddly enough, Scottie Pippin was my favorite player on those teams. Fourth, I am not a "back in my day the game was real" curmudgeon. My NBA experience only goes back to the 1970s so if someone wants to tell me that Wilt Chamberlain or Bill Russell is the GOAT, I would accept their opinion... provided they actually saw Jordan play as well. Obviously, since I only know players from the 1970s to today, Michael Jordan is the GOAT... or more precisely the GIHES (Greatest I Have Ever Seen). LeBron does not even come close for three very simple reasons. First, the GOAT takes a team, puts it on his back and carries them to championship after championship. The GOAT does not get dissatisfied with the group around him, survey the league and manipulate the formation of a super team. He does not join an established star as the side kick of that star's team. That is not to say the GOAT does it on his own. Jordan would not have won without Pippin. But Jordan made Pippin.Jordan did not get frustrated with the Doug Collins led Bulls and join Isiah, Magic or Larry. He tirelessly honed his game and those of his teammates to beat Isiah, Magic and Larry. Basically no one should even be having this conversation. LeBron gave up his ability to be part of it on July 8, 2010 when he ripped out his home town fans' hearts on national television. Just for fun, let's continue. Second, the GOAT does not cheat to win. The GOAT does everything within his power to win, but would never cheat. Just like Barry Bonds cannot be considered the GOAT of the MLB, neither can LeBron. 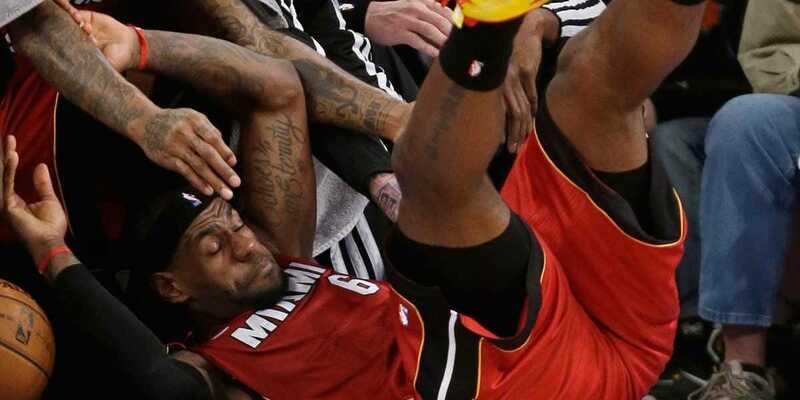 Flopping is cheating... and LeBron has made it a despicable art form. If someone wants to argue my first point, I can engage in a conversation. However, if anyone wants to argue this one... there is nothing more I can say. Every point LeBron got as a result of a flop is tainted. Every win in a game that involved cheating simply does not count in my book. Some may argue, "It is only one or two points" but getting an opponent in foul trouble as a direct result of cheating affects an entire game. To my knowledge, Jordan never cheated. Did he "get" some calls? Hell yes! But so does LeBron and every other star. I'm not even considering those for either player. Heck, Jordan's most famous shot against the Jazz occurred directly after Jordan committed an offensive foul. But blown calls or the "star treatment" is not cheating. Flopping is. LeBron cheats... a lot. Don't worry. This is not a GOAT and he isn't hurt, he just flopped. Finally, by definition, the GOAT should be unbeatable for a period of time. For six years, there was simply no way Jordan was going to lose and everyone knew it. 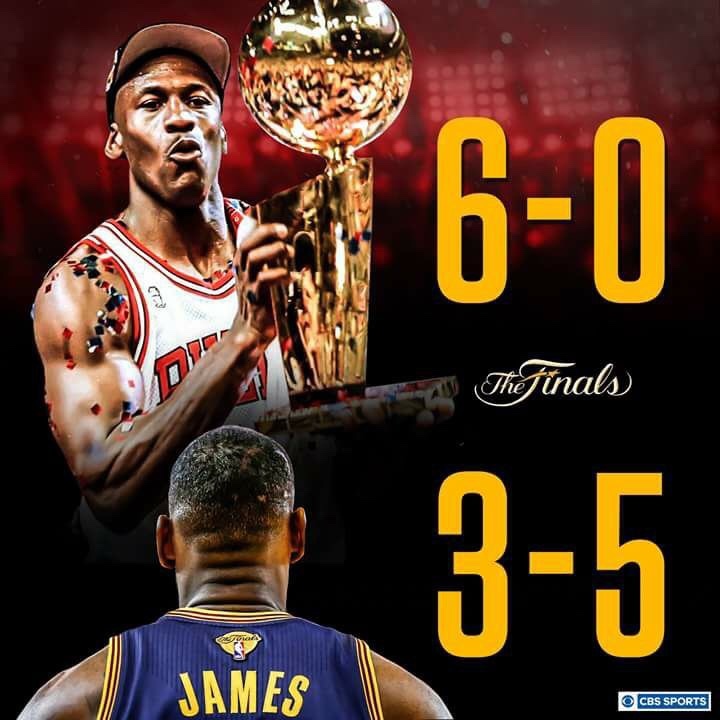 From 1991 to 1998 no one else had a chance at a championship as long as Jordan was on the court (he mysteriously "took off" two years in the middle of the two threepeats... which allowed the rest of the league to have some hope). Let me know when LeBron has his stretch of dominance long enough to be considered the GOAT. Eight finals appearances is quite impressive... but the losing record is not.